Captain Donald C. Chipman received an appointment to the United States Naval Academy and reported to Annapolis, Maryland on 1 June 1987 to begin his "plebe summer" military indoctrination. In June of 1988, as a Naval Academy Midshipman, he attended the Army Airborne Paratrooper School at Fort Benning, Georgia where he earned his Jump Wings. After four years, he received a Bachelor of Science Degree in Oceanography from the Naval Academy and was commissioned a Second Lieutenant in May of 1991. After The Basic School, he attended flight training and was later designated an Aircraft Maintenance Officer upon completion of the AMO school in August of 1994 at Pensacola, Florida. In September of 1994, he was transferred to MCAS Yuma, Arizona to serve as an aircraft maintenance officer at Marine Aviation Logistics Squadron 13. While there, he held billets as the ALSS Officer and Airframes Officer. 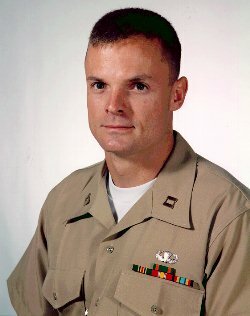 In May of 1995, he attended the Joint Aviation and Supply Maintenance Material Management (JASMMM) course in Athens, Georgia. In June of 1995, he reported to Marine Attack Squadron 311 where he served as an AV-8B Harrier Maintenance Material Control Officer. Additionally, he served as the IMRL Officer, Support Equipment Officer, Weight and Balance Officer and Aircraft Mishap Board Representative. He was promoted to his present rank on 1 September of 1995. In November of 1996, he was assigned as the Aircraft Maintenance Officer for a six-plane detachment to Okinawa, Japan with VMA-311. The detachment deployed to Okinawa, Ie Shima Island, and Iwakuni, Japan as well as Guam, Wake Island, Australia and Hawaii. Capt Chipman returned to Pensacola, Florida in June of 1997 to assume duties as the Executive Officer of Aviation Maintenance Squadron One.